Lately, I've been leading a very everyday kind of life...seeing friends, working, driving around, enjoying sun, grouchy about it raining...things that are everyday, but you never really write about much. Josh and I are just everyday people. Work - This past week I headed down to the bay area for work. My team member was on vacation and I was covering her work. We thought it'd be beneficial for me to cover her work in the office since the stage of the project was an in-person type stage. So, that's what I did...went down to Foster City. I do enjoy the visits since in the evenings I get to catch up with friends. I met up with my friend Lara, an ex-Acxiom worker, and also "the gang." See the center photo - that's "the gang!" Friends - We also have meet up with friends. 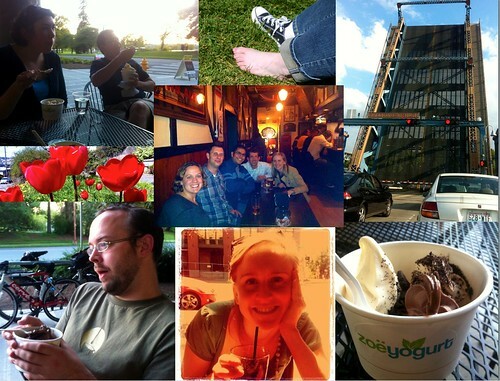 In fact, I discovered a new frozen yogurt place in Green Lake called Zoe Yogurt. See upper left and lower left & right photos. This is Zoe. Yum. Josh is in the middle of a very serious explanation of some sort in his picture. Katherine and Ryan are pointing at a kid terrorizing a dog in the top picture. Commuting Around - I drive around to appointment a bunch. Over to University District (aka U-District) the majority of the time. Unfortunately I must cross the water to get to that side and that means a bridge. In the winter the bridge doesn't go up that much. However, in good weather, it goes up and down quite a bit. It's annoying. Very annoying. The traffic gets all backed up and you have to sit there and wait. And wait. And wait. At first, when we first moved here, I though the bridges were cool. Now, they are lame. Weather - As you can see in the collage, the sun has made an appearance in Seattle. It's been a long, drawn out winter. And some days we are still seeing gloomy weather and rain. But now, the humdrum is interspersed with some sun. A little reprieve from the gray color that's everywhere. I must say, when the sun is out in Seattle, it's glorious. Glorious. (Feel free to say "glorious" like Will Ferrell in Old School). Hotels - This sort of belongs up with work, but since it has it's own pictures, I thought I'd put it below. My bay area hotel gave me, and I quote, "the second best room in the hotel." I get to my room and see I have an entire conference room in my suite. It felt awkward so I just closed the door. Pretty funny though.